Montessori Helper is the ONLY ALL-IN-ONE solution with Montessori Printables, Materials & Lessons seamlessly integrated into an Online Curriculum Tracker. The perfect companion for Teachers and Homeschoolers. Join our Premium Membership to get the Curriculum Tracker and more than 250 Lessons and Materials, and all our Android Apps and Bonus's ! Scroll down to find out more. Join now to tryout our full guided curriculum for Age 3 to 6. It allows you to track and monitor your child or student’s progress and record observations direct from your login view. You will love how easy it makes Montessori for you ! If you don't love it we will refund your money within 7 days. Thanks for the clear explanations in the use of the sensorial materials. They are a great help in my teaching the young kids. Thank you so much for your very fast response and for your comments. As mentioned, I think what you are doing is simply superb. You are helping people to bring education to kids who cannot afford this education. Most of us who do this work do so on a small budget of our personal funds. So I am grateful that this is affordable to me. Thank You for nice book.I am teacher in primary school in Croatia. My English is not very good, but I can understand a lot of words.I think that all good teachers just must do similar like M. Montessori done. Because that, I try to learn new methods conected with education, and I will be visitor of Yours site. Maybe only free topics, but ...You understand...I have downloaded book and I am so excited. I hope something I will do with pupils in my class. Great site! for Montessori directress, teachers, helpers, administrators of Nursery schools as well as mothers. keep it up. This is a fascinating real helper! Hi I am an Early Childhood Educator I really like this site and looking forward for more information about the Montessori Method. It's easy and fun 2 learn with Montessori apparatus. I love the Montessori method. It is the best. My children loved to add up to ten and they feel curious about putting the rods back forming the normal red and blue rods. Hi, My daughter is 7 yrs now she started learning through phonetic sound only and she made me learn also. Now she is able to read even the difficult words with sound(if she wants to) without my help. its the best medium for teaching kids. This site is the Best Educational Website I have EVER come across. I have been finding useful information since I established my Montessori College here in Ghana. Hi, I am Linda from Nigeria and I run a Nursery and Primary school. In my little understanding of what I have read about Montessori, we are practicing this method in our school. However, the biggest problem is how to get the materials and equipments . The ideas you have shared have really helped me .Thanks a mil....Linda. Lastly - I like the wording on the subscription page. Makes sense. And you really have nice materials - you really do. Hi! im currently studying to be a montessori teacher and i find your site helpful and interesting. Many thanks for your help. It has really helped. Very nice of you. Excellent service. It is really fascinating and very helpful,for teachers teaching in Childhood development.Could I please ask for help using this method in an Indigenous curriculum? 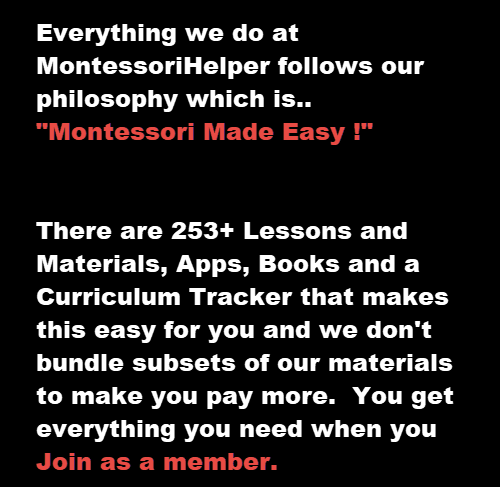 Montessori helper it a great pleasure to use this site. The site is good and helpful for resourceful and creative teachers. Thanks for the link.. I really appreciate your support.Thank you for sharing.I would like to more more about the Montessori Method. I like your site. since I started a montessori for the church I find it very useful. Thank your so much. would like to know more. hi. I really like this site because it has lots of information about the Montessori Method. I want to know more about it and wish the very best to your team for creating this mindblowing idea for us. We believe in the quality of our membership products. We will refund your purchase no questions asked if you request a refund within 7 days of purchase.